Join us in capturing the spirit and brilliance generated at the conference as it unfolds. Our community is a constellation of knowledge, and this initiative seeks to connect the proverbial stars as we highlight and promote innovative ideas and voices present at OLC Innovate 2018. Keynotes are one of the unique offerings at a conference, where we have the opportunity to hear leading voices and boundary-pushing ideas in our fields. We value the thought leadership and inspiration keynote speakers bring, and strive to find speakers who can bring a sense of cohesion or thematic fit to our proceedings. And we also are a community that strives to find and promote new voices who are contributing to the field in new ways, and are just starting to “gather moss,” so to speak. As a response to this effort, say hello to Star Search at OLC Innovate! This is our attempt to craft an innovative, emergent presence at the conference this year. And we need your help! If you have an inspiring colleague, friend or mentor that you’d like to see sharing their message, let us know. If YOU have brilliant ideas, we want to hear them. We see this taking several forms. It could be playing the role of citizen journalist, capturing the themes at the conference through a variety of media and forms. It could be as someone who brings a frame or theory or set of experiences that they see carving a new path for education, and sharing their ideas through the experiences of the week. If this sounds somewhat speculative and nebulous, you’re reading this correctly. We’re looking for new voices in new ways, and so we’re trying to embody that with how we set this up. We’re starting with the hunch that our collective voice is stronger as a strand of perspectives than as a singular sage. That is: we’re better together, we make sense together, and we sense-make together. Come join us! The original television show Star Search from the 80s-90s, champions and challengers alike would compete in a series of categories that judges and a home audience would vote on. The spirit of giving credence to the voice of the people was one that we wanted to harness with this new initiative at OLC Innovate, one that would capture what we as a community deem to be salient and meritorious. Volunteers will agree to serve as documentarians and citizen journalists, taking notes (in any format desired) on the sessions and events that they attend during the conference. The shared spaces where notes are captured will be available to conference attendees to see and contribute. The groups will convene on Friday morning to code and distill the big ideas that surfaced at the conference. 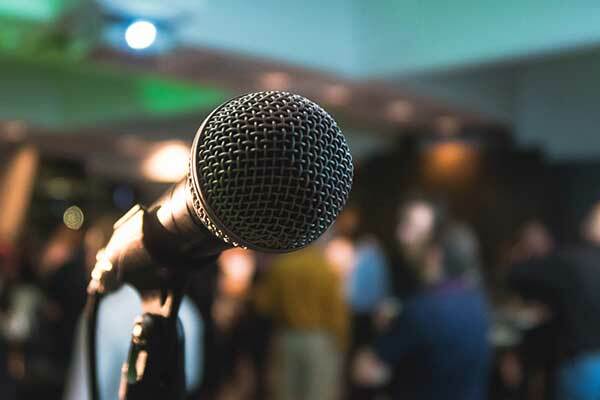 A member of the Star Search team will address the crowd with the findings in a lightning talk format as an energetic farewell to the conference and a compelling call to action. How can you help? It’s simple! Contribute themes and ideas to the collaborative document as you attend sessions at the conference. You can jump in any time and leave content however you see fit, including sketch notes and illustrations. Let’s bring this space ALIVE! If you want to take your volunteer role to the next level, contact Ben Scragg (bscragg@asu.edu) to sign up as a volunteer. We’ll assign you a selection of sessions we’d like for you to attend as the ambassador of that theme, as well as participate in the coding of the themes on Friday morning. Celebrate the findings with us at the Closing Ceremony on Friday, April 20 at 12:00pm and cheer on the new ideas and voices that’ll be championed in a closing lightning talk.